Christine L. Clodfelter, 75, of Syracuse, passed away on January 14, 2018 at Millers Merry Manor. She was born on May 3, 1942 in Bolimow, Poland to Edward & Lydia (Schroeder) Wolff. 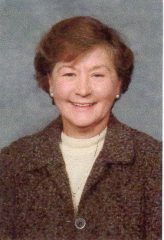 She was a 1961 graduate of Goshen High School. On March 1, 1964, in Goshen, Indiana she married Larry Clodfelter who survives. She was a lake area resident since 1968 coming from Goshen. She was a homemaker, worked part time as a clerk for NIPSCO, and served as church secretery for St. Andrew’s United Methodist Church where she was a also member. At one time Chris served on the Syracuse Town Board. Along with her husband, she is survived by her 2 sons – Dan (Shelly) Clodfelter of Syracuse, & Michael (Adrienne) Clodfelter of Indianapolis. 4 grandchildren – Mack & Landen Clodfelter, Ryan (Whitney) Allee, and Brittnee Alee. 2 great-grandchildren – MacKenna Allee, Harper Allee. 3 sisters – Edith (Bruno) Nickel of St. Joe, MI, Doris (Curt) Stuckey of Syracuse, and Rita (Ron) Cox of Lafayette. 1 brother – Gene (Janet) Wolff of St. Joe, MI. A memorial service will be held on Saturday, January 20, 2018 at 4 PM at the Eastlund Funeral Home with Pastor Jim Tormey officiating. Calling will be from 1-4 PM prior to the service. Memorial contributions may be made to St. Andrews United Methodist Church.